Why is this noteworthy? Well, anyone who has ever played a game online can tell you that online gaming communities aren’t always the nicest. Yes, they are often spaces filled with friends and team-building games, but they are also rife with toxic trolls, name-calling, and offensive language that is just downright unacceptable. Esports Edition has always operated under a strict code of ethics that ensures players of all levels, regardless of who they are, are welcome and respected. That’s also what AnyKey strives to do. Gillian Linscott, Esport Edition’s Community Manager, reached out to AnyKey in 2017 to see if there was any potential to work together. The fact that both organizations focus on building inclusive communities was too good to pass up on. Esports Edition is the first and only media group to join the affiliate program. Becoming part of AnyKey’s affiliate program proves that we are not only a go-to news source for fans and players, but that we are also dedicated to creating an online gaming community that is harassment-free. Toxic behaviour and comments won’t be accepted, period. “Our role as journalists should go beyond simply delivering the news to fans,” she continued. It’s incredibly exciting to be the first media organization that AnyKey has accepted. This new partnership means that Esports Edition and AnyKey will be working together on a number of upcoming projects. First and foremost, we’re collaborating on raising awareness of each other. Esports Edition will soon be listed as an affiliate on AnyKey’s website, and AnyKey will be featured as an active partner on Esports Edition’s website. Spotlight articles are also being written by some of Esports Edition’s staff writers, and shared through both organizations’ social media channels. 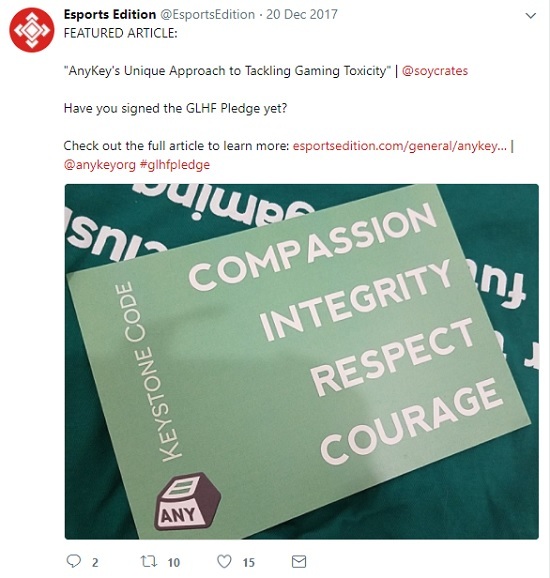 The first article, AnyKey’s Unique Approach to Tackling Gaming Toxicity, was published last month, and highlighted AnyKey’s successful GLHF pledge. This pledge, which was created in collaboration with Twitch, has had over 250,000 participants to date. It’s also a call to action that Esports Edition fully supports, as everyone should be able to enjoy online gaming without having to deal with toxic teammates. Over the next couple of months, Esports Edition will also have the opportunity to interview and write spotlight articles on three other notable organizations within the esports community: Anxiety Gaming, GaymerX, and DeafGamersTV. These stories will not only highlight some of the amazing work being done in the gaming community, but also allow Esports Edition to expand and work with new companies and organizations. While this new relationship with AnyKey is a success in itself, it’s not ending there; this is only the beginning. Esports Edition’s new affiliate status will open new doors, and allow us to expand our reach, cover new topics, and help foster positive changes within the esports industry and online gaming communities. “I wanted to set an industry standard that said ‘to be a successful media organization you don’t have to sacrifice ethics or morals to get clicks,’” explained Gillian. And she’s right. Moving forward, Esports Edition is hoping to create a joint series with AnyKey that focuses on creating more awareness of minority groups, and becoming a voice for change in the community. Lizz is the Digital Content Manager for Perk Canada, and spends the majority of her day ensuring that top-quality content is being delivered across all of Perk's brands. Outside of work, you'll probably find her reading books, writing about books, or spending too much time playing League of Legends.